Buy World’s finest Cultured Pearls & Freshwater Pearl Jewelry Directly from the Pearl Farms and $ave! [/vc_column_text][/vc_column][/vc_row][vc_row][vc_column][vc_column_text]When purchasing pearls, special attention must be paid to quality. Quality of pearl jewelry is determined by the surface flaws, color, shape, size, texture and the ability to match and blend, but most important aspect is luster. It is also important to know differences between freshwater pearls, imitation pearls, and dyed pearls. When we talk about the quality of pearls, it would help to better understand them if we learn how a single pearl is developed. Pearl jewelry is one of the rare jewellery that is developed from an organic gem, which doesn’t need any cutting, or other type of human work after it comes out of the shell. [/vc_column_text][/vc_column][/vc_row][vc_row][vc_column width=”1/4″][vc_single_image image=”3107″ img_size=”full”][/vc_column][vc_column width=”3/4″][vc_column_text]As for the size, you should select the big ones if money is not an issue for you. In terms of shape usually those with good roundness and with no surface defects should be your choice. Within the size, you should select those with beautiful and dignified shapes and with firm clasps and pins. At Oriental Pearls, we can design and make them to order on the spot according to the requirements of the customer. [/vc_column_text][/vc_column][/vc_row][vc_row][vc_column][vc_column_text]Luster: The thickness of a pearl`s nacre, as we discussed in the formation of pearls, would eventually determine the intensity of the luster of a pearl. Luster is a deep shine produced by Pearls` internal reflected light. The depth of the nacre coating depends on the type of mollusk involved, the water it lives in, and how long the bead is left in place before being harvested. The thicker the nacre, the deeper the luster becomes, the higher quality and longer durability of the pearl. A strand of high quality pearl necklace is normally full of luster, and it shines with dazzling brilliance. Luster is rated from very high to very low. Pearls with high luster give sharp reflections, and present high contrast between the reflections of light and dark, and a high degree of transparency. A pearl with low luster is dull, the contrast is low, and it has no transparency. Thus the price would be cheaper when all other factors are equal. Depending upon affordability, you should try to buy the the pearls that have a luster rating of medium to very high, as this will ensure that the pearls have a beautiful shine. At Oriental Pearls, all the pearls that we are selling are all nacre, since there is no nucleus inserted into freshwater pearls. That explains why our pearls all have a very high luster. High luster makes a pearl appear to glow and is more beautiful. Also the risk of wearing the thin nacre of pearl over time is not going to be a main issue of concern with our freshwater pearls compared with saltwater pearls. Surface flaws: when a pearl is being developed, it can develop marks, blisters, or spots, which are known as surface flaws. Just like a person`s skin, a pearl is rarely flawless. Each pearl is unique and usually has small surface imperfections on its “skin” that are commonly described as blisters, spots, blemishes, or indentations. The most expensive pearls still cannot be blemish free. However, pearls that have too many blisters and surface flaws can lose some of their beautiful appearance. Therefore, a pearl with fewer and less visible surface flaws is more rare and more valuable. When purchasing pearls, you should try to look for pearls with flawless to slightly spotted surface flaws, depending upon your preferred price range. At Oriental Pearls, since we get our pearls directly from farms, we can sell you the pearls that have less visible surface markings with much better prices in the same category compared with other retailers and online stores. Color: When purchasing pearls, the first decision is what color to choose. That will depend more on personal taste and skin color than anything else. Pearls of different colors suit different skin tones. The main colors of pearls are pink, milky white, peach, lavender, silvery white, cream, white with a rose overtone, golden yellow, black with lavender overtone, etc. Generally, pearls assume the color of the shell in which they are formed. 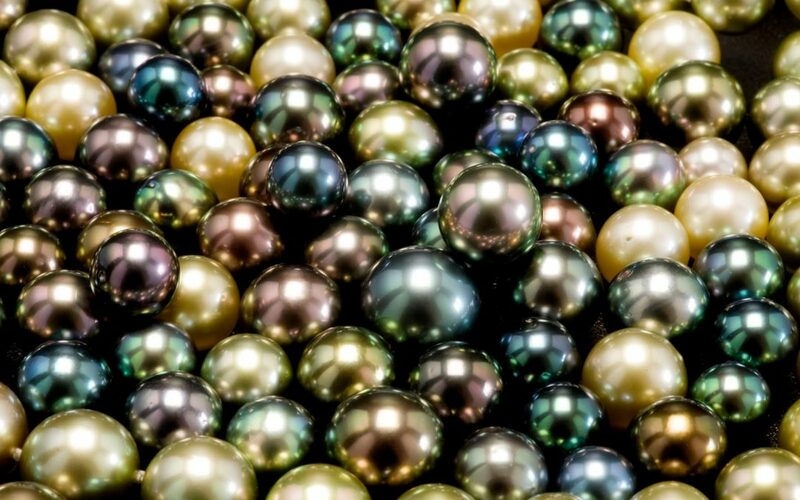 The most valuable overtone color in light pearls is rose and in black pearls, green is most desirable. Problems can arise in putting together matched strands of pearls for color because of their pearls wide range of pastel colors. Therefore, when selecting pearls to wear or give as a gift, the first important thing to consider is the recipient`s skin type. White rose pearls complement fair complexions; black pearls are flattering to dark hair. The second most important thing to consider is its close matching in shape. This is especially important for pearl strands and earrings. Matching and blending: When strung in strands, pearls are evaluated for their uniformity, that is, how well each pearl matches the others. Matching pearls is a labor-intensive process in which a pearl`s size, color, luster, surface markings, and shape are visually compared to, and arranged with other pearls in a strand. Pearls need to be sorted through piece by piece by size, shape, color, and luster. Size: Pearls come in a range of sizes. They are classified by the measurement of their diameter in millimeters. Size is an important value factor. Large cultured pearls are difficult to produce because they will stay longer in the shell, which increases the likelihood that the mature pearl will emerge with large blemishes and surface flaws that will decrease the value. The classic strand pearl measures 6.5 or 7 millimeters. For every 1mm increase in the size of pearls after that, there is a 100% to 200% rice increase. When choosing pearls as a gift, consider the neck size of the recipient. The smaller the person, the larger a pearl will look. The other important consideration is the affordability. Luckily, at Oriental Pearls, we can provide you with the largest sized pearls with most outstanding price. Don`t believe it? Compare it yourself! See our products. The internationally recognized standard for measuring pearls will always have a .5 mm differential within an individual strand. Per industry standards today, a strand measuring 8-9 mm will actually be composed of pearls measuring 7.5-8.5 mm. The smaller pearls will be located near the clasp, and the larger pearls will be in the center of the necklace. This is considered a uniform strand, not a graduated strand.